German Nobility fashion in 1570. Court dress 16th century. Home » German Nobility fashion in 1570. Court dress 16th century. German Nobility fashion in 1570, 16th century. Late Renaissance in the transition to the Counter-Reformation. Early Modernism, age of humanism. The Spanish fashion. The man is wearing the typical, short, loose-fitting coat, called the Spanish cape, loose over his shoulders. This, a waist-length, quilted jacket with slit sleeves, which was called “goose belly”. A carefully pleated ruff, which is in the form of late no longer attached to the doublet, but is worn as a standalone fashion utensil. At this size, the shape of the collar was produced by wires and stiff linen, silk. High set Harem pants with a padded waist. Buckled shoes and stockings. On his head a little beret, a full beard. For this purpose, a long rapier. The woman is in stiff corset bodice with drop waist. The narrow sleeves and collar are also completed by ruffles cuffs. The shoulders are padded bead. The style is worn high. She wears a Stuart hat, decorated with fine lace. The skirt is floor length and a short-term novelty at that time, in the form of the bustle or the later barrel Verdugado (guardians of virtue), bulked. She wears like the man a large ruff. 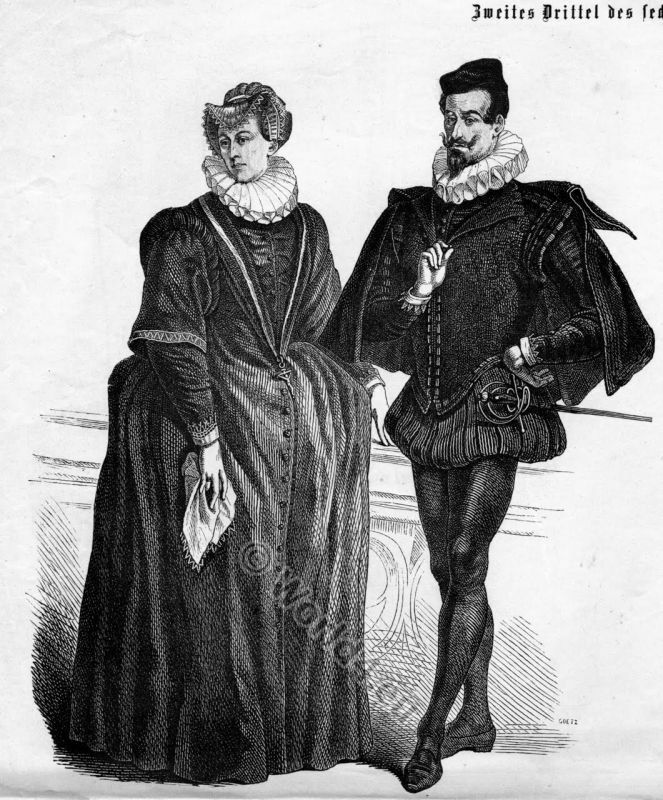 The cervical collar (also Fraise, millstone ruff) evolved as part of the clothing in the 16th Century from the the small fabric ruffle at the drawstring neck pulled in frilly collar. The ruff was usually emerge from white linen, with a curling iron tubular romped (pipe collar) and partly very expansive (hence millstone collar). Especially under the influence of Spanish fashion the the Frill is an integral part of the clothing for both men and women. This entry was posted in 1570, 16th Century, Court dress, Germany, Hat, Headdresses, Nobility, Renaissance and tagged Collar, Corset, Farthingale, Millstone ruffs, Renaissance fashion era, Verdugado on 9/20/13 by world4.